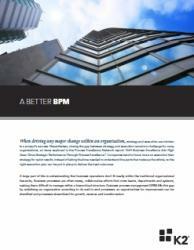 BPM suites add value but are often monolithic systems that take a high level of knowledge and training to implement and use, causing upfront disruption that can adversely affect the business. This also makes these systems slow to make an impact and difficult to use for one-off needs – creating challenges for companies that need quick results. Organizations need agile platforms that are faster to market and provide deeper value. To this end, business process application suites provide flexible solutions that support your full range of BPM needs, including top-down initiatives, smart process applications, and the need for rapid app development platforms that can be used by IT and business users alike.